Each winter in the village of Jukkasjarvi, about 100 miles north of the Arctic Circle in Swedish Lapland, an architectural wonder is reborn. 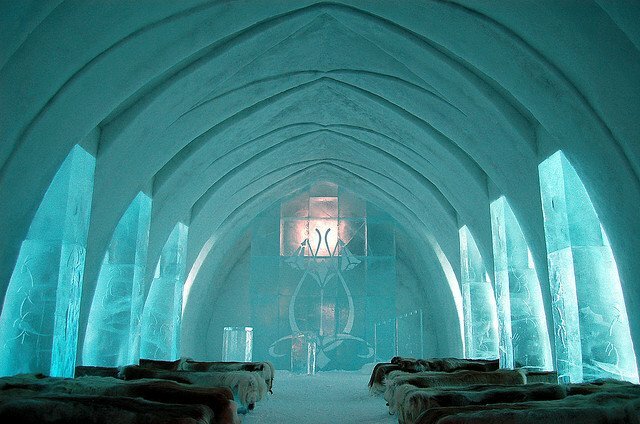 This is ICEHOTEL, the first and largest hotel constructed entirely of ice. Equal parts architecture and art, the hotel is designed and created by a new team every year — and it’s become so famous that artists are now submitting their proposals a full year ahead. Despite the fact that ICEHOTEL melts away completely each spring and is recreated in a totally new design every winter, some things do remain constant. The hotel is by far the biggest structure in Jukkasjarvi — a village so tiny that sled dogs outnumber people (800 to 600). It occupies just over 59,000 square feet of frozen real estate. The ice used to build this breathtaking structure comes directly from the nearby Torne River. About 2000 tons of ice and an additional 3000 tons of ice and snow combined are required to create its vast labyrinth of chambers, corridors, and decorative art. 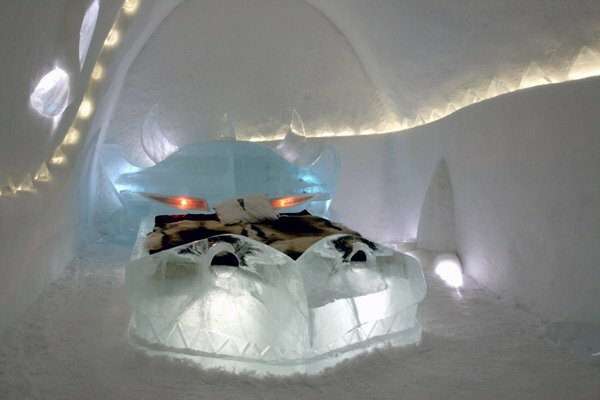 The specific accommodations (yes, people really do stay here) change every year, but generally include a massive luxury suite, a number of art suites containing decorative and sculptural elements, ice rooms, snow rooms, group rooms, a vodka bar, and a chapel. During the winter of 2011 – 2012, the hotel had 47 rooms in total. There are also several permanent structures onsite, including a restaurant, a warm changing room for guests, cabins, and other heated accommodations for the faint of heart. Restrooms are also heated — but located a short walk away from the ice structure. Sometime in mid-November, snow builders begin spraying steel forms with snow. In a few days, when the snow is completely frozen, the forms are removed — leaving the skeleton of ICEHOTEL. At this point, artists from all over the world gather to begin the task of realizing their crystalline dreams. The work is completed in phases, and as sections are finished, guests arrive to stay for the day or overnight and view continuing construction. When the entire complex is complete, the hotel remains full for the duration of the season. Providing spectacular views of the Northern Lights, ICEHOTEL is a popular spot for adventurous travelers and hosts hundreds of weddings each year. When the spring thaw begins, ICEHOTEL begins to thaw as well, melting slowly back into the Torne River until it has completely disappeared. Lasting only a few months and unique each year, a visit to this handmade, dreamlike creation is truly an experience of a lifetime.